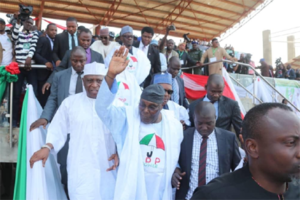 Ambassador Yahaya Kwande, elder statesman and member of the APC Board of Trustees (BOT), was among dignitaries that attended the PDP presidential campaign rally in Jos on Saturday. Also at the rally held at the Polo Ground were Alhaji Atiku Abubakar, the PDP Presidential Candidate, as well as Dr. Bukola Saraki, Senate president and Director-General of the PDP campaign organisation. Also in the Plateau capital for the campaign were Mr Uche Secondus, the National Chairman of the party, and his Deputy, Mr Lyel Imoke. News men, covering the event reports that the party big wigs were joined by Sen. Jeremiah Useni, the governorship candidate of the party in the state, and his running mate, Dr. James Dalok. Also at the Polo Ground for the activity were Sen. Jonah Jang, the immediate past governor of Plateau, Alhaji Ibrahim Mantu, former Deputy Senate President, and Mr Fidelis Tapgun, a former Plateau governor. NAN recalls that Kwande had earned the wrath of the APC in June 2018, when he followed Atiku to the Plateau State headquarters of the PDP, when he came to the state to solicit for votes from the party’s national delegates. Miffed by Kwande’s fraternity with the rival party, the APC chairman in the state, Latep Dabang, issued a query to him and later warned him against repeating such. Kwande, in his reply, had claimed that Atiku had been a long standing friend, and told the APC that he would not abandon such a close friend because of political reasons. Parrot Gist Copyright © 2019.